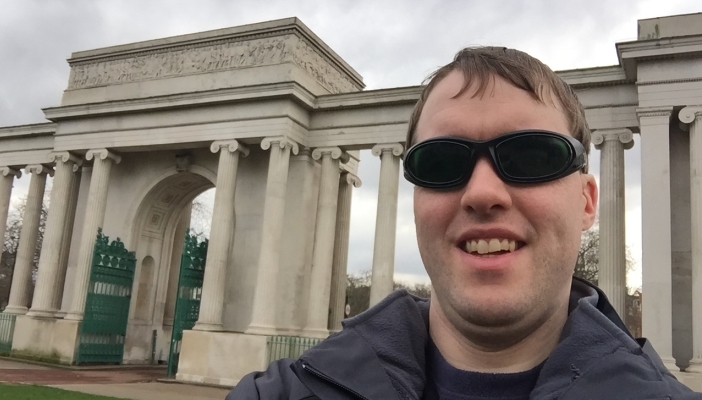 NB Online spoke with IT Supervisor Glen Turner about one of his eye conditions, aniridia. He opens up about this condition, including how it affects his sight and what technology helps him on a day to day basis. Glen also shares some of the strange questions he has been asked. Aniridia means I don’t have an iris in my eye. The iris controls the size of the pupil to regulate the amount of light coming in, so without it I can’t adjust to changes in light conditions very easily. This makes me very sensitive to glare and bright light, even if it’s not sunny outside, and I struggle in dark conditions. My eyes do adjust a tiny bit, so there may be a small remnant of the iris muscle present - but any adjustment is very limited and much slower than normal. I also have nystagmus which means my eyes move and shake involuntarily so I can’t focus on things at a distance; they need to be close to me or enlarged. I’ve had both conditions since birth, inherited from my mother. Aniridia is the main condition, with nystagmus a related side-effect. Nystagmus is very common among aniridia patients, but they don’t all have it. And nystagmus isn’t exclusive to aniridia - it can exist on its own or come as part of the package with a variety of other conditions. I was diagnosed at birth. Both of my parents were also visually impaired so the doctors were monitoring me closely in that regard. I don’t recall there being any complications, but I know I was examined regularly to see how I was developing as I grew up. There are no treatments I’m aware of. Any treatments I could have would mainly be to stop my eyesight getting worse, for example if I developed cataracts or glaucoma, which I am at higher risk of getting. My mother already had the condition, so my parents and our doctor were familiar with it. I also went to a school for the visually impaired in Exeter, so the doctors there understood as well. These days I am a member of the Aniridia Network and the Nystagmus Network charities. I can’t drive and I find it harder to navigate places that are unfamiliar, complex or dark. Generally though it doesn’t stop me from doing a lot. I’ve got a degree and I’ve been in my job as an IT supervisor for a council printing department over 13 years. I regularly go out to socialise, visit attractions, watch theatre shows and so on and this includes going out at night, which I can do if I stick to well-lit areas. 7. Do you know if your conditions affects different people in different ways? It’s hereditary, caused by a mutation in the PAX6 gene (involved in the formation of tissues and organs during embryonic development) from one parent. If both parents had passed on the faulty gene, I would have died. Aniridia can be accompanied by a variety of other conditions and issues, from things like nystagmus and auditory processing disorders, to more severe conditions like WAGR syndrome (a disorder that affects many body systems). 8. What would you like eye health professionals to know about your condition that may be helpful when treating other patients? I’d like them to be aware of my sensitivity to bright light, and just to remember every aniridia or nystagmus patient is affected to a different degree, depending on the condition’s severity and any accompanying conditions. 9. Is there any technology that helps you day-to-day? When I’m out and about, I use green tinted sunglasses to reduce glare, and a monocular (a small telescope) to read signs and see details at a distance. On computers and on my iPhone, I invert the screen colours (making it white text on black) to avoid the glare from bright backgrounds and I use zoom and text enlargement features. The most common question I get is, “Don’t glasses help?”, as if I’ve never thought of it. But I have tried them, and they don’t help. I also get asked if there’s surgery to fix it, which there isn’t or I’d probably have had it. And sometimes people will assume my sight is worse than it is, and try to help me without actually asking me if I need the help first. Read about Glen’s experiences of living with nystagmus on his website Well Eye Never. Find out more about aniridia on RNIB’s eye conditions page. Glen lists his top 10 pet peeves as a visually impaired person to get them off his chest and hopefully spread some awareness in the process. Book now for the Aniridia Network’s Conference on Saturday 14 April in London.